Do you believe in coincidences? Aliens? Conspiracy theories? You might after you read this. On Ash Wednesday a man in New Mexico discovered the face of Jesus staring back at him on a tortilla that he was about to bite into. Here is the report from UPI. A New Mexico man said he discovered the image of Jesus Christ on a tortilla he was preparing on Ash Wednesday. 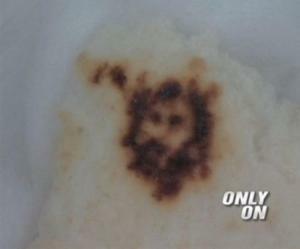 David Sandoval of Espanola said he was shocked to discover the face of Jesus on his food, but he has always been a believer in Christianity, KOAT-TV, Albuquerque, reported Thursday. "It became even more astonishing, with it being the first day of Lent," Sandoval said. "I passed it to my mom and the same response came from her, 'Oh my God.'" Sandoval said he posted a picture of the image on Facebook and the response has largely echoed his own. "Everybody has been able to see it. They're calling it a miracle," Sandoval said. "New Mexico has always been known to have interesting things happen during Lent time." Its not clear if the man had given up tortillas for Lent and perhaps this is a case of divine intervention. It's bad enough eating fish and other food that stares back at you. But when the Son of God shows up on your sandwich it may be time to call it a wrap. Insult your friends like a Lutheran! Martin Luther is known as the father of the reformation. His 95 theses were the spark that set fire to Europe changing its religious and political landscape forever. But Luther also had another spark that tended to cause fire, his tongue. Luther was a prolific writer but he could also be down right caustic at times. He is known for saying some pretty nasty things about his enemies. Small wonder Luther did not like the Epistle of James with the comment in 3:5 about the tongue being a fire. James seems to describe Luther! But perhaps Luther is your hero to such a degree that you wish you could insult your enemies and friends like a reformer! Well now you can. The Martin Luther Insult Generator allows you find quotes from Luther's works that you can use to insult those around you. For instance, no longer like your neighbor? Try this insult from Luther. And then for those attorneys who are trying to extort money from you and your church. The Martin Luther Insult Generator is great fun for the whole family. You could learn a new insult everyday and try it out in your church or place of employment. And the bet thing is you don't have to worry about doing anything wrong because Luther also told us to SIN BOLDLY. HT: Stuart @ EChurch Blog. Think you are the messiah? Perhaps you have Jerusalem Syndrome. In some ways Jerusalem is unlike any other city in the world; home to the world’s three monotheistic religions and some of the most ancient and impressive architecture in the world. In other ways it is like every other city. It is noisy, dirty and crowded. The buses belch exhaust at you as you walk down the street and the stray cats scamper between your feet as you make your way. And like other cities in the world there is what I call the “personalities.” Those people who seem to make the city what it is. They are the people you see day- in and day-out who are as much a fixture of the city as the statues, fountains and buildings. In the time that my wife and I lived there we got to “know” several of Jerusalem’s personalities. There was “shekel shalom” who sat outside our apartment building on our way to work and school every day. We called him “shekel shalom” because we did not know his real name and that is all he ever said to us as we walked by. When you stopped and tried to talk to him he would simply repeat “shekel shalom,” even after you gave him shekel. Just outside of Zion Gate was King David. Not the real one of course. This was a guy from Britain who dressed in a white toga and played a harp while singing to the tourists. He had a basket to collect money and a set of CDs for sale. This man was a panhandler’s panhandler. And the tourists loved him. He would greet them with a song as they got off the busses and they would respond with donations and the purchase of a CD or two. Rumor had it that he was putting his kids through college with what he made. Inside the old city was a woman, dressed in a silky, purple toga. On her head was a purple turban with a metal menorah sown to the top. I am not sure what her story was, but she would sit in the Jewish Quarter and mumble or spin around in circles. I think she was predicting the return of the messiah, but I never was able to find out for sure. What I did not see, however, was a genuine case of Jerusalem Syndrome. This is the name given to the condition suffered by those who, upon coming to Jerusalem, are overwhelmed and either think they are the messiah or the messiah’s messenger. WiredMagazine has an article this month on the syndrome and it is very interesting. They describe the syndrome as follows. There’s a joke in psychiatry: If you talk to God, it’s called praying; if God talks to you, you’re nuts. In Jerusalem, God seems to be particularly chatty around Easter, Passover, and Christmas—the peak seasons for the syndrome. It affects an estimated 50 to 100 tourists each year, the overwhelming majority of whom are evangelical Christians. Some of these cases simply involve tourists becoming momentarily overwhelmed by the religious history of the Holy City, finding themselves discombobulated after an afternoon at the Wailing Wall or experiencing a tsunami of obsessive thoughts after walking the Stations of the Cross. But more severe cases can lead otherwise normal housewives from Dallas or healthy tool-and-die manufacturers from Toledo to hear the voices of angels or fashion the bedsheets of their hotel rooms into makeshift togas and disappear into the Old City babbling prophecy. Treatment does exist and is often administered at the Herzog institute. But sometimes the victims are used for what seem to be cruel experiments. Actually, it wasn’t that long ago that one respected Israeli physician put two patients who both claimed to be the Messiah in a room together just to see what would happen. Each rabidly accused the other of being an impostor, barking fire-and-brimstone threats. In any case, as I said, it is a very interesting read. I have known a few people who acted like they were the messiah, but never met anyone who actually thought they were the messiah. But if you are planning a trip to Jerusalem you may want to read the article so as to be on the lookout in case one of your fellow tourists suddenly starts acting strange. If, on the other hand, you find yourself in a room with someone else arguing over who is the “real messiah.” Well, then . . . Yet another "Ancient Bible" Discovered? Last year it was the Lead Codices. Two weeks ago it was a first century fragment of Mark's Gospel. 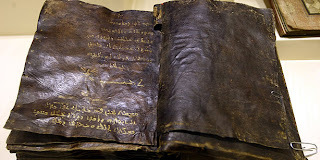 This week it is a 1500 year old, handwritten, Syriac Bible. The news stories claim that it was seized from smugglers, is worth $28 million (but you can get a photocopy of a page for the cut rate price of $1.7 million). Oh, I forgot to mention that the Vatican wants to see it, which means there must be a conspiracy here somewhere. Here is a bit of the article. Well, what to say? It all sounds exciting and too good to be true. I don't know Syriac and I am certainly not an expert on ancient manuscripts. But Pete Williams is and over at Evangelical Text Criticism he suggests that it is probably a fraud and that we have seen this Bible before. So if you have seen this story don't get too excited because it looks like either the facts are wrong or it is a fraud. 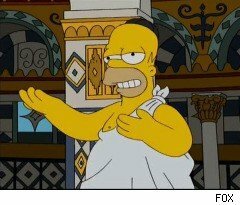 Embarrassing Elements in the Gospels? 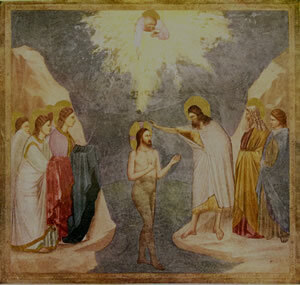 Fresco by Giotto, c. 1300. 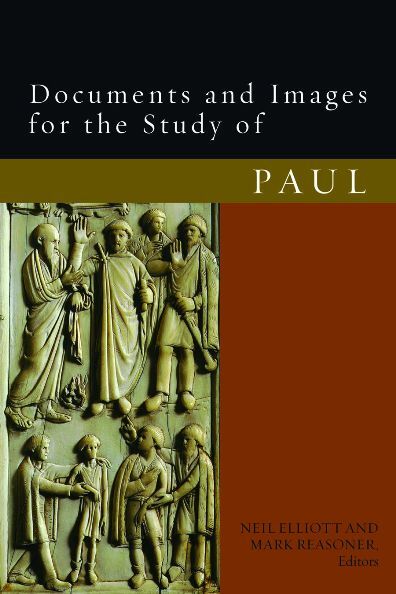 The average reader of the gospels is probably not familiar with the idea that some of the material in the gospels might have been embarrassing to the authors and the early church. The "criterion of embarrassment" is one of the criteria used by New Testament scholars as they study the Historical Jesus. Those elements found in the gospels that might have embarrassed the gospel authors or the early church are often weighed as "more authentic" since the author perhaps wished that he did not have to include the material, but also felt it was a necessary and important part of the story. One example of this is the story of John the Baptist baptizing Jesus. Some Historical Jesus scholars view this episode as potentially embarrassing to the early church since Jesus, who is the Christ and source for the forgiveness of sins, submitted to baptism by John, a prophet promoting a baptism for the forgiveness of sins. Why would Jesus need this baptism? Such an episode would be potentially embarrassing. Over at the NT Pod Cast Mark Goodacre has posted installment 59 of his pod casts. Mark looks at the criterion of embarrassment and discusses in more detail the story of John baptizing Jesus. Mark does a good job of unpacking the topic. He also provides some interesting thoughts on why the criterion of embarrassment might not always be the most helpful criterion. Congrats to Michael Schmidt. 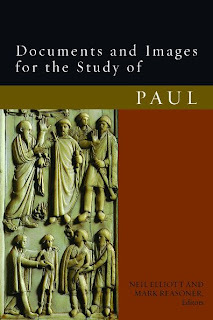 He is the winner of Neil Elliot and Mark Reasnor (eds) Documents and Images for the Study of Paul (Fortress Press, 2011). Michael, you have days to claim your prize. Please send your details to jbyron@ashland.edu and I will send you the book. Didn't win this time? Keep checking back, I have more to giveaway in the future.